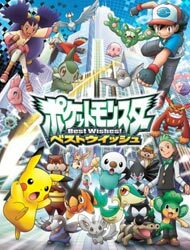 Plot Summary: As with both the Advanced Generation and Diamond & Pearl series before it, the Best Wishes! series begins with only Ash Ketchum, headed off to the Unova region, located far away from Kanto, Johto, Hoenn and Sinnoh, with his Pikachu. After he meets up with the new trainer and rival Trip and the region's Professor Juniper, he gains traveling companions in Iris, a girl from a town known for its Dragon Pokémon, and Cilan, Pokémon Connoisseur and the Grass Pokémon specialist of the three Straition City Gym Leaders.